The CMP3, manufactured by Kipp & Zonen, is an ISO-second-class pyranometer that monitors solar radiation for the full solar spectrum range. It connects directly to a Campbell Scientific datalogger and is used for many meteorological applications. 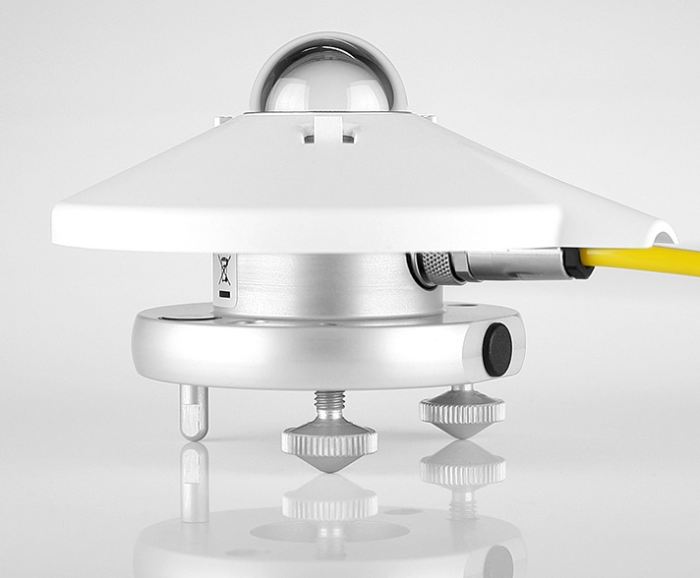 The CMP3 measures solar radiation with a high-quality blackened thermopile protected by a dome. The blackened thermopile provides a flat spectral response for the full solar spectrum range, which allows the CMP3 to be used under plant canopies or lamps, when the sky is cloudy, and for reflected radiation measurements. The CMP3 includes a white snap-on sun shield that reduces the sensor's temperature. It also has a bubble level and adjusting leveling screws, which enable the sensor to be leveled without using a leveling base. The CMP3 produces a millivolt signal that is measured directly by a Campbell Scientific datalogger. Two CMP3 pyranometers can be mounted back-to-back to make a low cost albedometer. Contact Campbell Scientific for more information. The CMP3-L includes a bubble level and adjusting leveling screws, which allow the sensor to be leveled without using a leveling base. The CM225 Solar Sensor Mounting Stand is typically used to attach the sensor to a mast, crossarm, or pole (1.0 in. to 2.1 in. outer diameter). The CM225 consists of a rectangular plate, mounting bracket, U-bolts, washers, lock washers, and nuts. The CMP3-L should be mounted away from all obstructions or reflective surfaces that might adversely effect the measurement. Alternatively, the CM245 Adjustable Angle Mounting Stand may be used. It includes slots that can be adjusted to any angle from horizontal to vertical. If the glass dome on the CMP3-L is damaged, how can it be repaired? Is a replacement shield available? If the dome becomes damaged, contact Campbell Scientific or Kipp & Zonen to discuss replacing the dome. The sensor will need to be sent to Kipp & Zonen for any repairs. What might cause a CMP3-L to give a negative reading? This may be caused by conditions in which the dome of the sensor is warmer than the thermopile. Most users see a small negative value at night. This offset, as it is commonly termed, can be important for monitoring the performance of the sensor. How can the CMP3-L be connected to a data logger? For example, are RS-232 connectors used? The CMP3-L has a passive thermopile that produces a small analog voltage that can be equated to a representative amount of incident solar radiation. Campbell Scientific recommends connecting the leads of the CMP3-L to a Campbell Scientific data logger through a differential analog input terminal. Can a CMP3-L be connected directly to a computer? No. The sensor needs to be connected to a data acquisition system, such as a Campbell Scientific data logger. The LP02-L is a sensor manufactured by Hukseflux, whereas the CMP3-L is manufactured by Kipp & Zonen. 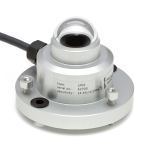 Both sensors meet the ISO classification of a Second Class pyranometer.